Lock in a great price for Kihaa Maldives Resort & Spa – rated 8 by recent guests! First, the staff was absolutely wonderful. Great conversation and they worked extremely hard to make our stay special. The island and resort facilities are gorgeous. The resort is fairly new and our villa, one of the Beach Reserve Villas had a small but beautiful view of the ocean. Even though it's the smallest of the rooms, we thought it was very spacious, private, and comfortable. There are some reviewers who didn't care for the food, but we thought it was varied and terrific. We bought the all-inclusive and think we saved money this way. The transfer is very well organized and we got to take advantage of the resort facilities on our last day while we waited for our boat even though we had already checked out. If you compare what you get at Kihaa with other 4 or 5 star Maldivian resorts, I think it's an amazing value. All in all, a brilliant holiday! 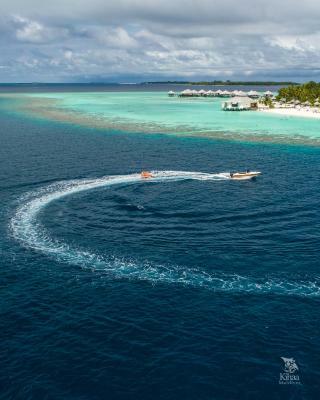 I chose the resort being the closest to Hanifaru bay with arranged tours for snorkeling with the incredible Manta gatherings and otherwise scuba around in nice locations with a wonderful diving center team. This worked great, and the resort itself was a real treat for my wife and myself. We had a great time at this wonderful resort! Our bungalow was amazing, the beach was perfect and the staff extremely competent, friendly and patient: Our airline lost our luggage, and the staff was so helpful, provided us with shirts and sarongs and tried their best to get the baggage back - even though it was the fault of the airline! Also, diving and snorkelling trips were wonderful - only can recommend the diving school. The spa massages & facitlities were wonderful and relaxing as well. We will come back for sure! Very friendly staff, buffets were very good, with a lot of variety. The pools are great, the beach is lovely and very clean. For good snorkelling, you can go from the resort, but go a bit further out esp if you are a good swimmer as the corals is better and there is much more sea-life to see. The hotel was great, the staff was very good. The food was magnificent. The beach is great. We made a unique holiday. We had an amazing holiday at Kihaa maldives. We enjoyed snorkeling around the house reef which is just few steps from the beach. The service was also great, and food was fantastic. We couldn´t have wished for more. Thank you!!! Kihaa Maldives Resort & Spa This rating is a reflection of how the property compares to the industry standard when it comes to price, facilities and services available. It's based on a self-evaluation by the property. Use this rating to help choose your stay! Located on the coconut-shaped island in Baa Atoll, Kihaa Maldives is surrounded by lush green vegetation, white sandy beaches and a corral reef. The resort has an outdoor swimming pool and offers relaxing spa treatments. Villas at Kihaa Maldives are luxuriously decorated and equipped with a flat-screen TV. Views of the white sand beach and sparkling ocean can be enjoyed from large windows. The spacious private bathrooms come with a bathtub. For recreation, guests can play beach volleyball or take a day trip to one of the local islands. Snorkeling and diving activities are also available. Free Wi-Fi is available in public areas. Enjoy local and international dishes at the on-site restaurant, or arrange for a romantic private dinner on the beach. There is also a bar. The island is a 20-minute domestic plane ride away from Malé International Airport. This property also has one of the top-rated locations in Kihaadhuffaru! Guests are happier about it compared to other properties in the area. This property is also rated for the best value in Kihaadhuffaru! Guests are getting more for their money when compared to other properties in this city. When would you like to stay at Kihaa Maldives Resort & Spa? With a private pavilion, this luxurious villa enjoys views of the white sand beach. Includes a flat-screen TV and a well-stocked mini-bar. Private bathroom has a bathtub. With a Land area of 829 ft² per villa, characterized by its own garden, a day bed sofa with teak floors, open-air bathroom and a wood patio facing the beach extended from the porch. With a land area of 958 ft² per villa, these elegantly rustic villas offer a day bed sofa with teak floors, open-air bathroom with their beach front outdoor terraces offers the perfect ocean view, a place of idleness and your own home feeling, ideal for snorkeling. These spacious and elegantly furnished suites are ideal for families. It features a separate living area with a sofa and a luxurious outdoor bathroom with a sunken bathtub, rain shower and toiletries. This luxurious suite features 2 bedrooms with a king-size bed each, a separate living room and a large patio with dining area. Overlooking the ocean, the private pool comes with a spacious sun deck. Private bathroom offers a standalone bathtub and separate outdoor rainshower. Please note that this room can accommodate two extra beds. Tastefully-furnished, this private villa features a bedroom with king bed, a separate living room, a spacious patio and a terrace with beach lounge chairs overlooking the vast ocean. Private bathroom features a standalone bathtub and separate outdoor rain shower head. The Garden Villas features a large bedroom, a spacious wardrobe and a bathroom with bathtub and rain shower. Private pool with hardwood deck area. It is located only a few steps away from the Indian Ocean. Located just few steps away from the Indian Ocean shore, the Maldivian house features one bedroom with king-size bed, one spacious bathroom with outdoor rain shower, splendors bathtub, additional separated toilets services, and cozy living room ideal for leisure time with head-to-head walking closet. House Rules Kihaa Maldives Resort & Spa takes special requests – add in the next step! All children under 12 years are charged USD 93 per night for extra beds. Any additional older children or adults are charged USD 192 per night for extra beds. Kihaa Maldives Resort &amp; Spa accepts these cards and reserves the right to temporarily hold an amount prior to arrival. Kihaa Maldives Resort & Spa accepts these cards and reserves the right to temporarily hold an amount prior to arrival. Domestic Flight transfer estimated of 25 minutes journey from Male International Airport. Guests must send arrival and departure flight details directly to the property at least 5 days prior to arrival. Please get in touch with the property for details flight timings and baggage restrictions. Room rates are quoted on Double Occupancy. More than two (2) people staying in one room shall be consider an additional person. Additional meal plan charges will be applied as per number of person. Adult: 12 years above will be considered adult. Charges apply as per adult policy. Child: 2 to 11.99 years of age will be charged as per the child policy. Infant: Below 2 years will be charged as per the child policy. ADDITIONAL PERSON CHARGES: (Excluded from room rate) Nightly rate. Infant under 2 years will eat for free based on the rules and meal‐plan accompanied by an adult, excluding alcoholic beverages. Maximum 2 free Infant per unit paid. Children are considered from 2 – 11.99 years. Room rates are based on 2 adults and additional charges apply for accommodations and meal plan depending on the season. The resort will inform you about such charges upon receipt of the booking. All children 0-11.99 years are subject to pay USD 6.00 per day (Green Tax) and 2-11.99 years are subject to pay Transfers additional USD 250.00 round trip, inclusive of all taxes . All Inclusive beverages only in Undholi Bar. Afternoon tea and coffee served at Undholi Bar along with snacks. Mini-bar with beers, soft drinks, mineral water refilled daily. Bottle of sparkling wine and fruit basket on arrival, A la Carte candle light dinner and extended turn‐down service. Please note that marriage certificate must be presented at check‐in and the marriage date shall fall within the last 6 months to avail the benefits. Please inform Kihaa Maldives Resort & Spa of your expected arrival time in advance. You can use the Special Requests box when booking, or contact the property directly using the contact details in your confirmation. In the evening there were lizards on the ceiling. the internet signal room was bad. We loved our stay at Kihaa. The only improvement we found that was needed is being able to get cocktails/wine/beer on the beach near the villa. So we had to make a choice, lay on the beach near our villa where it was peaceful and quiet but with no drinks or go to the pool area where the bar is but then you are away from your place. The only other regret was that you don't get a seaplane ride for your transfer. To be fair, the island itself was lovely, some stuff were really friendly, the spa was nice, and we enjoyed ourselves for most of the time. But, most islands in Maldives are similar on these aspects. What makes an organization great is how they confront issues, on which sense, Kihaa resort really disappointed us. 1 Usually we had to wait 2-3 hours for room service, because the stuff who answered the phone forgot to tell the restaurant and we had to call more than 3 times for the food. It happened again and again. So we complained when checkout. After talking to several stuff and managers, finally one manager gave us 50% off for the room service as a compensation. It was fine. 2 We paid the resort for the Maldivian domestic transfer and told them our international flights' schedule. The arrival trip was fine. But the departure trip turned out to be a disaster. In such a peak season, (according to the airport stuff) when flight delay is always expected, the resort booked us an interesting domestic flight. Even if it could arrive exactly on original time, we could get to the international terminal only 30min before the boarding time at best. It was very risky already. We would still need to check-in, pass the security and customers in a small airport. (The resort claimed it was the best connection.) Unfortunately, the domestic flight was delayed, and what's worse, re-routed. It stopped over another island - Ifuru. We had no idea about this situation until we were stopped getting off the plane, thinking we had arrived at Male. What a surprise! We were totally shocked and desperate. Why nobody from the resort told us?! They arranged our transfer and should be monitoring any change of the flight schedule. When we arrived at Male, our international flight had already left. We had to stay in Male for one night, and booked an expensive ticket back home the next day to not miss our following work schedule. It is from Male and short domestic flight has to be taken. Daily events organized were not so great and were boring for many. Expensive. Beautiful place with nice beach and pools. Staff are very friendly and helpful and go out of the way to make sure guests are comfortable and taken care of. Food variety and quality was very good. Food options v less ..only sandwiches and burgers ..no good food ..we did our survival on french fries..no indian food ..beer was out of stock .. Wonderful facility & location. Staff were incredible and attentive without intrusion. Just off a liveaboard diving vessel and spent the additional week diving at Kihaa with Alex which was fantastic. Stayed in 316 Sunset villa which was perfect for quiet solitude and made us feel like we were the only ones there as its away from the main area. The only b-minor was, that house keeping didn’t come until very late in the day or had to be reminded. But once mentioned specifically, it was taken care of. Extremely friendly staff, very service oriented, very warm and personal welcome. A big thanks goes out to Nicole, guest relations. Beautiful resort, fantastic nature, a big variety of food.